IRMNCH & Nutrition Program to hire services from Medical Officer / Senior Medical Officers (MOs / SMOs) for the post of District Coordinator,IRMNCH & Nutrition Program in all 36 districts of Punjab (one post for each district). Applications are invited from qualified, professionals, experienced individuals. MBBS preferably Post Graduate in Public Health or equivalent. Minimum two years of experience in field. 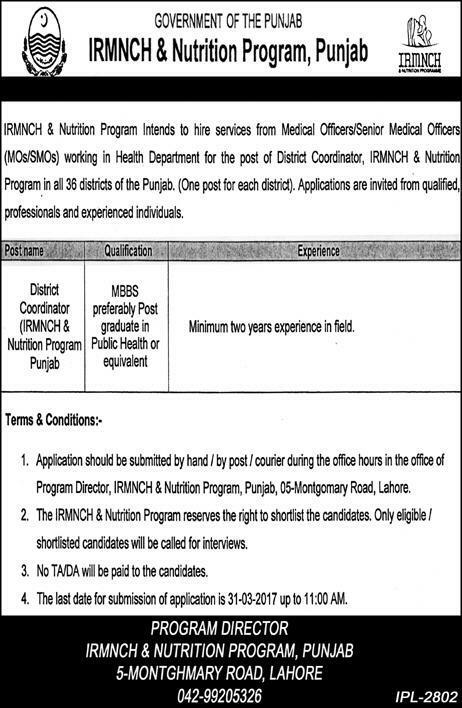 Application should be submitted by hand / by post / by courier during the office hours in the office of "Program Director, IRMNCH & Nutrition Program Punjab, 05 Montgomary Road,Lahore."